New research from Children's HealthWatch illustrates there is no safe level of homelessness. 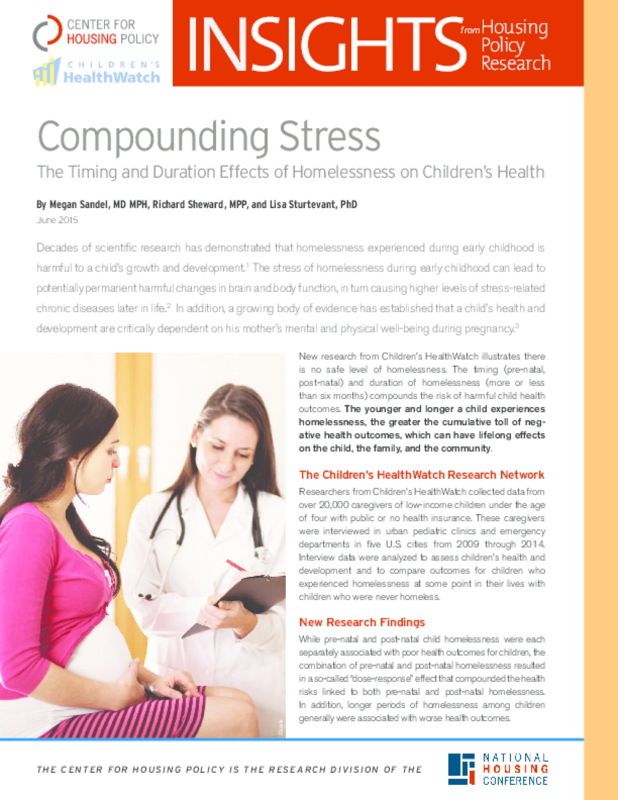 The timing (pre-natal, post-natal) and duration of homelessness (more or less than six months) compounds the risk of harmful child health outcomes. The younger and longer a child experiences homelessness, the greater the cumulative toll of negative health outcomes, which can have lifelong effects on the child, the family, and the community. Researchers from Children's HealthWatch collected data from over 20,000 caregivers of low-income children under the age of four with public or no health insurance. These caregivers were interviewed in urban pediatric clinics and emergency departments in five U.S. cities from 2009 through 2014. Interview data were analyzed to assess children's health and development and to compare outcomes for children who experienced homelessness at some point in their lives with children who were never homeless. Copyright 2015 Center for Housing Policy.